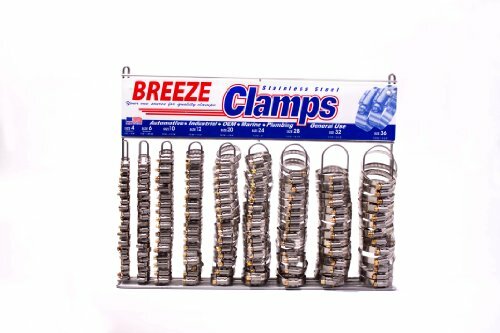 The Breeze 6210 clamp assortment with rack consists of a chrome epoxy steel display rack and an assortment of stainless steel hose clamps. The 6200 display rack is 16.75" high and 21.6" wide, and can either mount to the wall or stand alone. The stainless steel clamps resist scaling and corrosion, and meet Society of Automotive Engineers (SAE) J1508 standard for quality assurance. The included SAE type M worm-gear clamps are lightweight and are a size suitable for air and fuel lines, and are of assorted sizes. The included SAE type F worm gear hose clamps have four-piece construction for strong clamping, and are of assorted sizes. This Breeze 6210 clamp assortment is suitable for use in automotive applications.